We were fortunate to enjoy one of our rest days on Christmas Island, after a very long leg over water the previous day – see the News page for details. 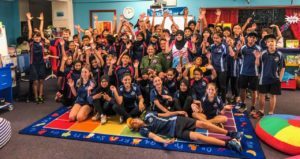 We thank them for their hospitality and to the school for welcoming Wg Cdr Pote and Sqn Ldr Landy to talk to the students. This once more presented an opportunity to speak not only about our expedition but touch on the importance of STEM subjects in today’s environment. The engagement did not stop there for we then held a static display of the aircraft for those interested to come and see: the first Eurofox to make an oceanic transit; probably the first Light Aircraft Association aircraft to make an Indian Ocean oceanic transit and the first piston engined aircraft to visit Christmas Island for a very long time! We thank everyone on Christmas Island for their warm welcome and for their best wishes on our onward journey! Whilst enjoying one of our rest days, we were delighted to be invited to talk to some students at the Karachi Library. We spoke not only about the challenging expedition we are undertaking but also the importance of STEM subjects and inspiring an interest in future generations. This stimulated some great questions from our audience, and so thank you very much to the British Council Pakistan for having us! 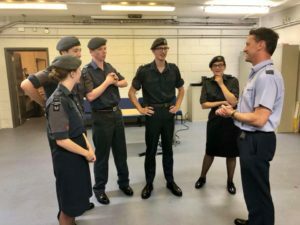 As one of our many outreach efforts in order to promote RAF100 and STEM subjects, Wg Cdr Pote visited 2491 (Lyneham) Air Cadets (Dorset & West Wilts Wing) to talk about the expedition. They were a keen audience throughout the presentation resulting in some inspired questions. Photo credits to Sgt Louise Curtic, RAFAC for capturing the moment. 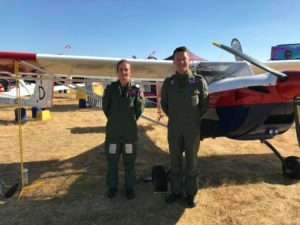 With RIAT drawing a significant crowd from all corners of the world, we had the opportunity to speak to a vast array of visitors. Many people were able to offer advice and suggest other potential places to visit en route for our consideration. We had a great weekend and do hope that everyone we spoke to will be following us via our live tracker! A special mention to our generous sponsor Thales for hosting our team for afternoon tea. Front row seats to watch some of the air displays was warmly welcomed!